Some American news publishers are struggling with Europe's new stringent privacy rules. 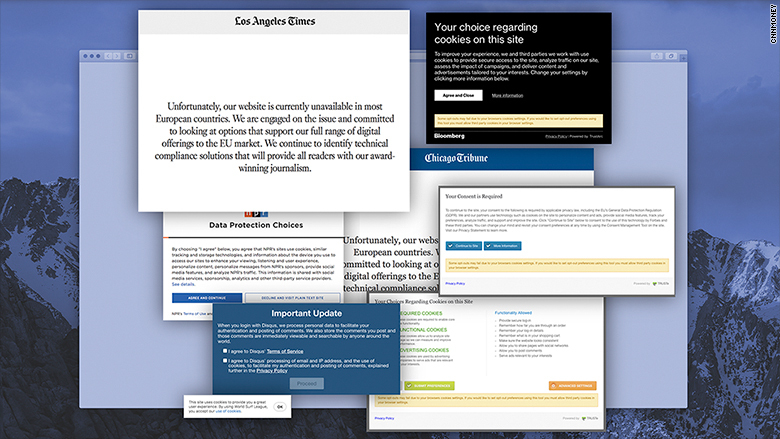 The Los Angeles Times and Chicago Tribune websites were taken down in most European countries on Friday after new European Union data protection regulations came into force overnight. The same statement appeared on other Tronc-owned sites including the Chicago Tribune, Baltimore Sun and Orlando Sentinel. 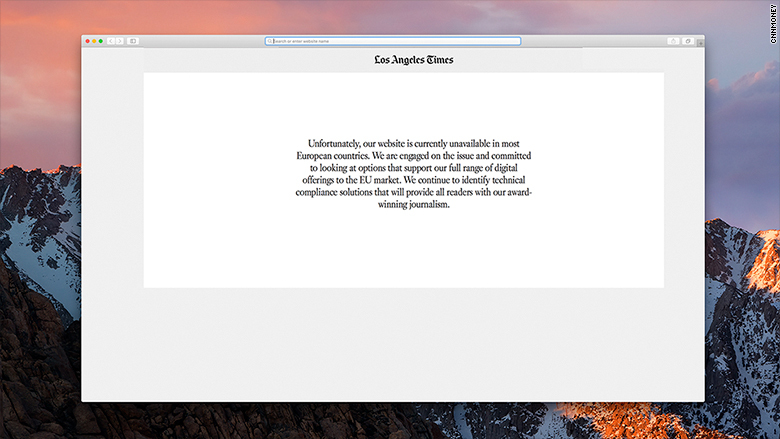 The LA Times is no longer available for most European readers. The General Data Protection Regulation (GDPR) changes the way companies around the world collect and handle personal data. The strict rules were designed to give European individuals more control over their privacy and online data. The new law affects any organization that holds or uses data on people inside the European Union, regardless of where is it based. That means a US website tracking browsing histories of Europeans is affected. GDPR rules have forced some websites to suspend or restrict their operations in Europe. Other publishers have taken a different approach to Tronc. European readers of USA Today's homepage are now being offered a stripped down version, devoid of any advertisements. A disclaimer at the top welcomes readers to the publication's "European Union Experience. Readers are invited to learn more by clicking through to a statement that reads: "It appears that you're visiting us from a location in the European Union. We are directing you to our EU Experience." USA Today says its site does not collect "personally identifiable information or persistent identifiers from, deliver a personalized experience to, or otherwise track or monitor persons reasonably identified as visiting our site from the European Union." Spot the difference! 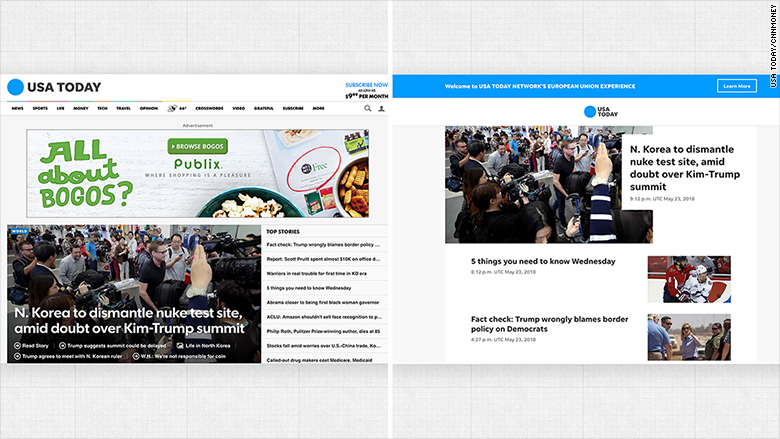 USA Today's new European homepage is on the right. The homepage for Bloomberg's news site won't allow European visitors to read stories until they review a statement about how the company tracks their activity online. NPR's website is requiring visitors in Europe to agree to its tracking policy before they can enter. Those who decline are sent to a stripped down "plain text" site that lists its top 10 news stories in small blue lettering. The linked stories are devoid of photos or even bold headlines. Related: Are you getting too many GDPR emails? Many companies have not managed to comply with the rules in time. 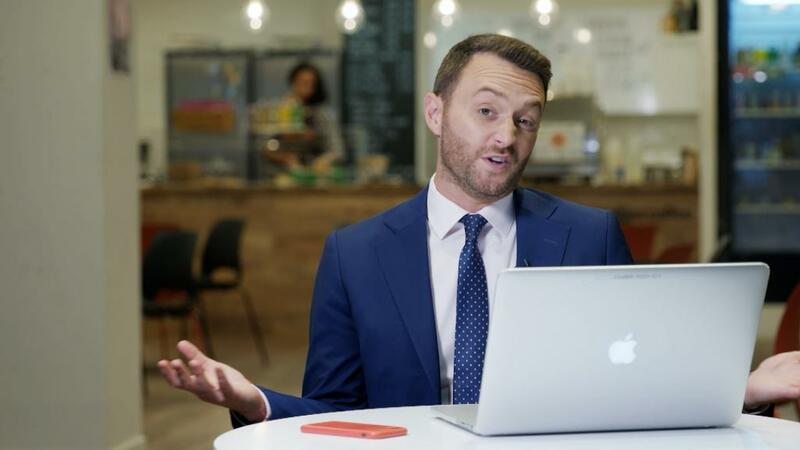 If regulators find that they are not abiding by the rules, they could face fines of up to €20 million or 4% of their global annual sales, whichever is bigger. Consulting firm Capgemini reported that 85% of surveyed firms said they were not ready for the new GDPR law. Just one in 10 companies were considering the user experience as they worked to comply with GDPR rules, according to the survey. -- Ivana Kottasová contributed reporting.